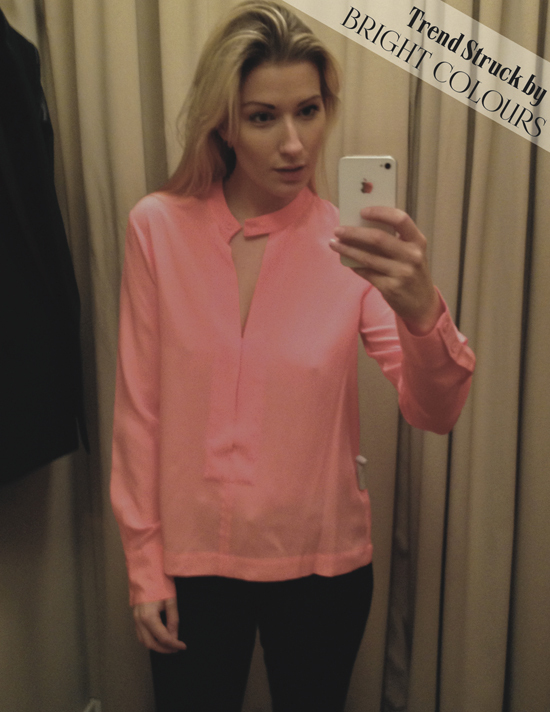 What I loved: it's clear that the detailing on the blouse is what makes it so special. Allowing the shirt to do the talking for the rest of your outfit makes this a perfect piece to wear for a night of cocktails with your ladies! What I loved: most definitely this colour is what struck me initially. Wearing this blouse under a blazer just for a pop of colour or on its own for a more lax look makes this a great versatile piece to have in your closet this spring. 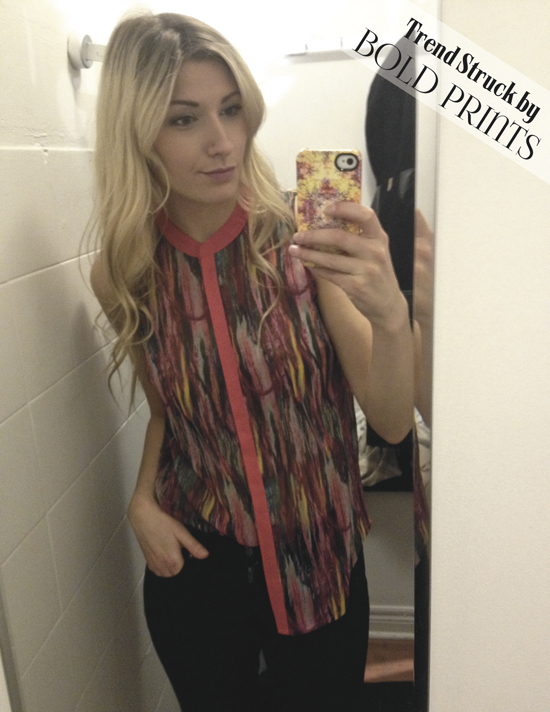 What I loved: that I am colour blocking just with these pants! No need to pull off the trend in separates which is how I've done it in the past. I'm also a fan of fuchsia and red together so it screamed LOVE to me instantly. 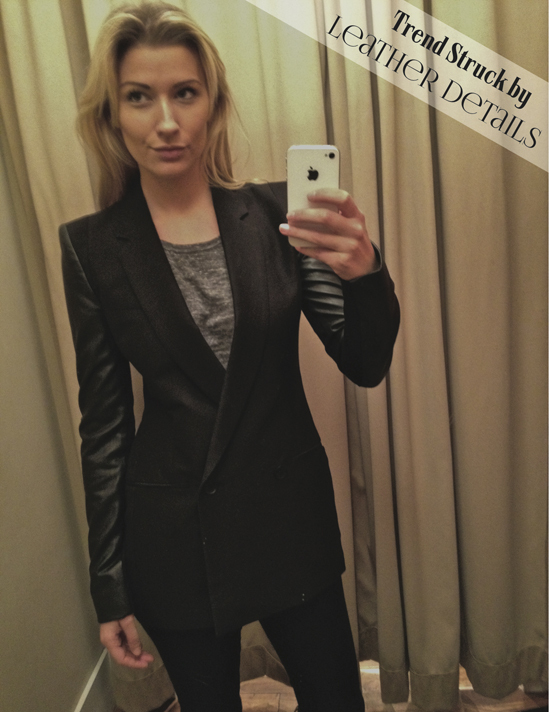 What I loved: aside from the leather sleeves that I have been hoping to find it's also the cut of the blazer. I love that it has such great length by sitting below the hips making the blazer look like it literally fits the body like a glove. What I loved: both the warmth of cashmere and being inspired by another great colour pairing within the same family. I am such a big fan of monochromatic looks for both the contrast and unity when these hues are brought together. What I loved: the use of several bright colours that appear as brush strokes and polished off with the coral trimming. Details like this really make a piece pop. 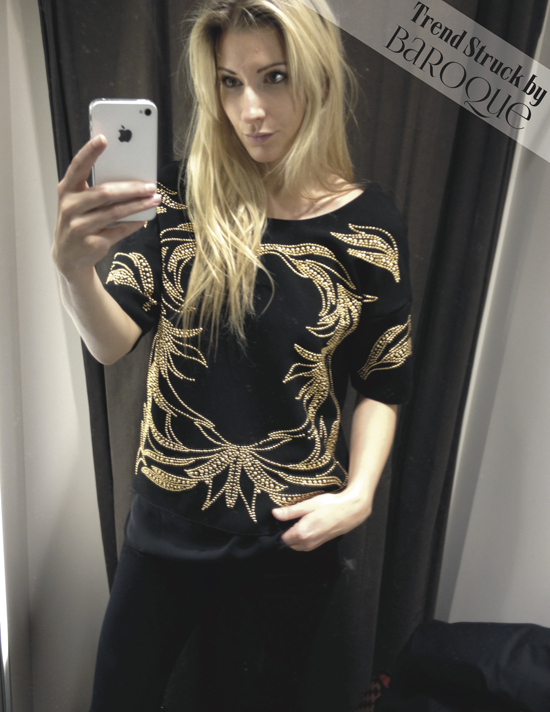 Think you have an idea of what came home with me from todays change room diaries? Find out if your right on my Facebook page tomorrow! 1) Burberry. 2) Balmain. 3) Lanvin. 1 Asos. 2 Valentino. 3 AWear. 4 Ted Baker. 5 Romwe. 6 Chicnova. 7 Mango. 8 Jill Stuart. 9 Asos. 10 Juicy Couture. 11 Lipsy. I find it funny that I'm lusting over velvet lately because about three years ago I clearly remember thinking to myself how velvet was something I could never see coming back in style... and if it did there was no way I would conform. With a little passing time my acceptance eventually grew and now I'm more inspired than ever to add velvet to my closet. I mean really you're just adding texture to your outfit! Hopefully the images that I've rounded up for you above will help with some style-spiration! If you thought velvet was more evening wear because of it's dressy appeal then let's observe how in fact it is easy to transition from day to night. The first street style image above is a velvet maxi skirt but it's toned down with a black sweater making it casual enough to wear during the day. Keeping the entire look dark made the velvet more subtle where if she would have worn a lighter colour the impact would have been greater. This is great to keep in mind if you are just introducing velvet to your everyday look and need to ease into it. Now take a look at the very last image of Nicole Richie taking velvet into the evening with perfection! Simply adding a dressy blouse with a fresh pair of heels has now turned you into an evening classic. I also really love the images of the wide leg trousers along with wine coloured blazer for day time. The trousers are taken to a super casual place being worn with a simple white tank and yet the look is still so incredible. For more business casual by day opt for the velvet blazer to complete your attire without feeling like you are being too fashion forward for the office. Now add these two together and here you have your evening look. Check out Elizabeth Olsen above where she's wearing a matching red velvet suit and no that's not too much velvet for one outfit. That girl's got serious style here! The final point I'm going to touch on is velvet vs crushed velvet that we are seeing a lot more of. If you are aiming to look more trendy then crushed velvet would be a better choice for you like the dress Vanessa Hudgens is wearing above. If your style is more classic stick to a velvet dress like the simple one Nicole Richie is wearing (with a rad jacket that made this whole look). 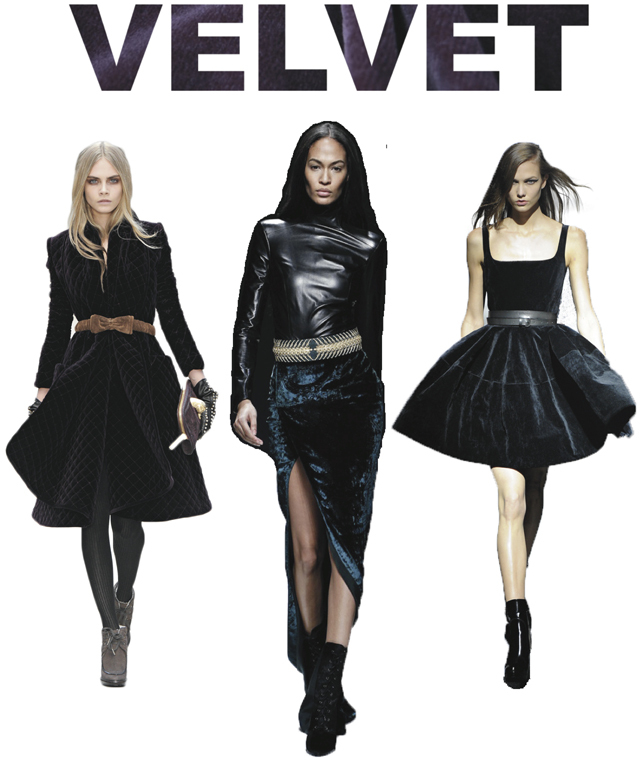 What velvet pieces have you been wearing this season?